Media and movies like to suggest that robots will take over our jobs, the world and even us. But is this really the case? We ask VU professor and Spinoza prize winner Piek Vossen (Faculty of Humanities) a few questions. 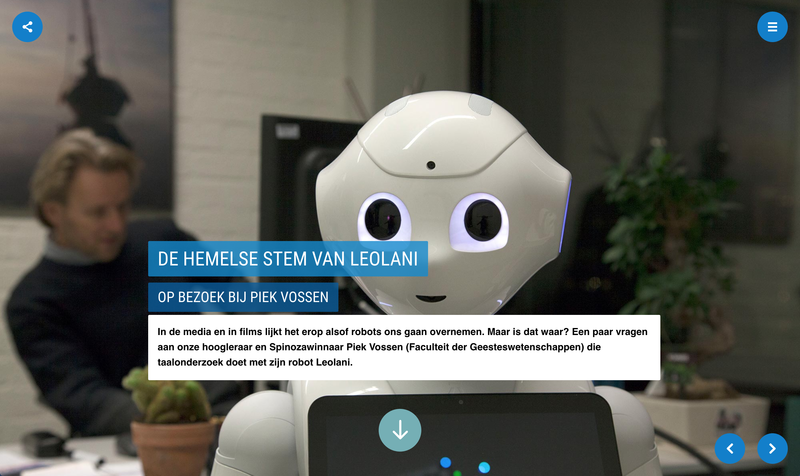 Piek Vossen conducts research on language with his robot Leolani. Too much science fiction. Robots have been around for years, especially in factories, and did us more good than harm. Workers found other employment, and robots freed humans from monotonous and dangerous tasks. I rather think about the myriad of possibilities that robots offer and prefer to think in terms of augmentation rather than replacement: in healthcare, education, security, elderly care, babysitting, and preventing bullying. Having eyes, hands and intelligence in places and situations where eyes or hands are otherwise not available. In addition, I am thinking of the huge challenges we face developing satisfactorily functioning robots, because we are far from ready. For example, how to communicate with such a thing? What kind of scientific research do you perform with the robot? The biggest problem with robots is that is so hard to communicate with them. One can replay a video of everything the robot has seen, but it would be much more effective to simply talk to it, ask for what the robot has to report and, next, discuss and explain how you want things. In that case, the robot needs to understand what it has observed or done and what the implications are and being able to report on this in an effective way with me. I assume that no machine or system is perfect. The engineer who thinks he or she can make the perfect machine or the perfect system is wrong. Uncertainty and awareness of failure must be built into robots from the start. You have to be able to talk about that, explain what went wrong and why you want things differently. I mean with the robot, not with the engineer. 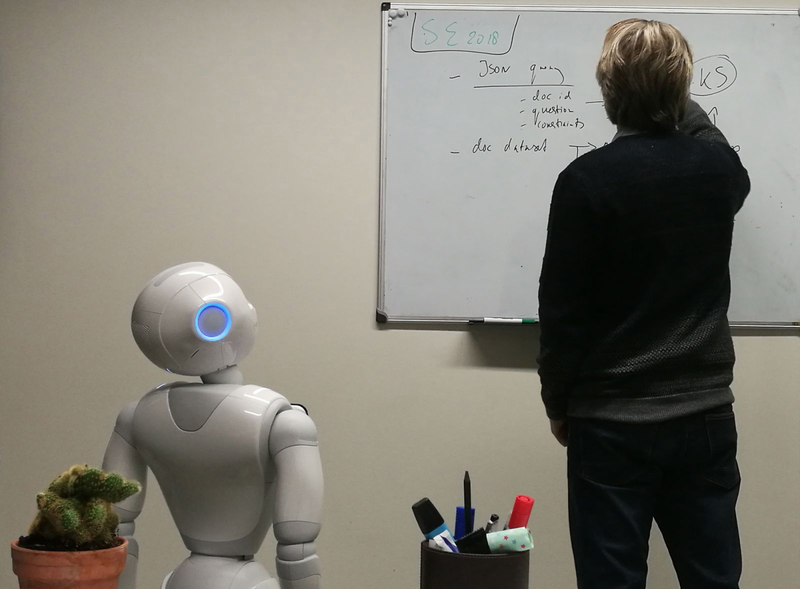 It is my ambition to teach linguistic communication to robots so that people and robots can work together as teams and strengthen and complement each other. The robot must therefore be able to deal with people’s intentions and emotions, and constantly communicate about uncertainty, doubt and check whether there is mutual understanding and agreement. By the way, we have decided that the robot is a “she” and we named her Leolani. A Hawaiian name meaning “heavenly voice”. We will also give her character traits and moods, which in turn will influence communication. Who are you cooperating with? With the Spinoza prize money I was able to acquire the robot. Together with Bob van Graft’s budget via UC-IT (VU Information technology services). 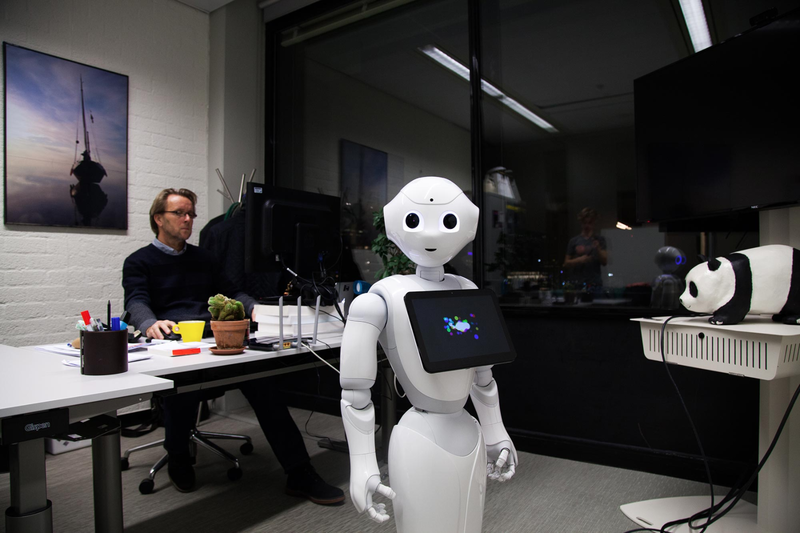 We aim to stimulate education and research into social robots. We also work together with Johan Hoorn and Elly Konijn from the Faculty of Social Sciences. At the moment three students are working with Leolani. Two of them are my Spinoza University Research Fellows for this academic year and one research student is funded by Bob van Graft from UC-IT. We use the Google API for speech recognition, IBM Watson and Wolfram Alpha as knowledge stores. These available technologies give the robot a big advantage and allow the students to work on exciting aspects such as uncertainty and social communication. Meanwhile we had four live presentations and have more events planned in the next few months. Leolani performs better every time. For what purposes will you use Leolani in the future? We are in the process of investigating the possibilities. We consider serious applications in education. For example for children with disabilities and in elderly care (I am Alice). We will submit proposals for projects, and apply for collaboration with other researchers.